When individuals start to consider weight loss surgery, they typically think of something commonly called "stomach stapling." However, the technical name for the most common bariatric surgical procedure is a Roux-en-Y gastric bypass procedure. The procedure is a significant operation requiring full anesthesia and a fellowship trained surgeon who is comfortable doing such bariatric procedures. What is a Roux-en-Y Gastric Bypass? The most common bariatric surgical procedure is a Roux-en-Y Gastric Bypass. The procedure can be performed as either an open abdominal procedure via a midline abdominal incision or as a laparoscopic procedure, in which several small incisions are made in the abdomen. Through one incision, a small fiberoptic camera is passed. Through the other incisions, ports are placed through which instruments are passed and the procedure performed. Bariatric surgery is increasingly being performed laparoscopically due to the decreased hospital time required for recovery, although the procedures do require more technical skill. Overall, laparoscopic surgery is equally effective as open surgery. The procedure's aims are as follows. First, the stomach is divided into two parts: a small pouch through which food will pass, and a second pouch, which will not be used in digestion. Dividing the stomach in this manner creates the volume restriction that will allow patients to feel "full" or "satiated" early in a meal. Then, the small intestine is divided about 45 centimeters past the gastric outlet. There will now be one end connected to the second non-functional stomach pouch, and one free end. 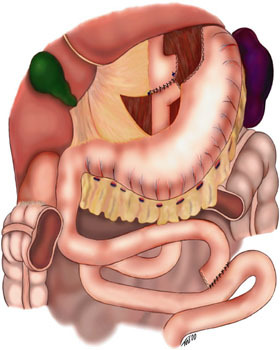 The free end will be connected (anastomosed) to the small stomach pouch, while the end connected to the nonfunctional pouch will be reconnected to the small intestine further down along the GI tract. The end connected to the new, smaller stomach is called the "Roux" limb since it is the route food will take. If you were to draw this out, you would now see that the small intestine now takes the shape of a Y as the two limbs join together, hence the name "Roux-en-Y". The term "stomach stapling" comes from the fact that in older versions of the operation, the stomach was not split into two pouches, but rather partitioned simply using staples, hence "stomach stapling." However, this is no longer recommended as the stomach occasionally would heal over the staples, defeating the purpose of the surgery. Who should get a Roux-en-Y Gastric Bypass? In general, patients who are morbidly obese who have failed other weight loss programs are candidates for weight loss surgery. The concept of 'morbid obesity' can be measured using a statistic called the "Body Mass Index" or BMI. Basically, this statistic normalizes one's weight based on one's height. Without it, one could not tell the difference between a 150lb man who was 5 feet tall versus one who was 150 lbs and 7 feet tall. Most BMIs fall between 18 and 50. A normal BMI is between 18 and 25, overweight 25 to 30, obese 30 and above, morbidly obese 40 and above. Anyone with a BMI over 40, or a BMI over 35 with other medical issues, is potentially a candidate for bariatric surgery. Research the procedure beforehand. Find out who will be performing the procedure and how much experience they have. Don't forget that you still need to follow healthy habits, such as eating right and exercising. Simply having the procedure alone will not change your life permanently. If you continue to eat high calorie foods, you will eventually gain back all the weight you lose in the first few months after the procedure. Remember, the procedure is an extreme effort to help you lose your weight, but at the end of the day, you are in control and in charge of your weight loss, not the surgeon's knife. Help the procedure help you.